This is Wally. Wally is many things, including a much adored member of my household, a German Shepherd Husky mix and a boy rescued from a very final fate at a shelter in Georgia. 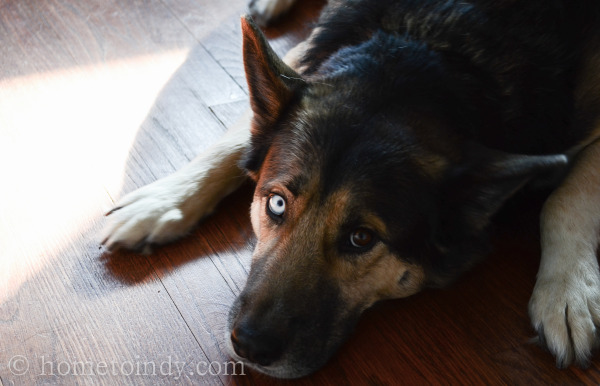 Ultimately, our family rescued him, but before we even knew about him, Amber Marks, of German Shepherd Rescue Indy had heard about him and was hard at work arranging to save his life. She communicated with the shelter in Georgia, arranged transportation for him to come to Indiana and had begun looking for foster or adoptive families who might be interested in him. I remember the day I first saw his face. My husband and I had been thinking about adopting another dog and he had been trying to convince me that we should pick a Shepherd. I, however, was not totally sold on the idea. I love big dogs, but I wasn’t sure Shepherds were the right breed for me. One evening, Aaron said “you should really see this dog I found posted online”. He turned his screen around, and there was Wally's face, those striking, plaintive eyes and I was done. It was over. I was completely wrecked about this guy and have been ever since. We immediately applied with Amber and within a few weeks they drove him from Georgia to Indianapolis. We got a call from Amber on September 1st, 2012, saying the transport was on it’s way and they should arrive late that evening. She wanted to know if we could take him straight into our home and that’s how we ended up in a McDonalds parking lot on a frosty fall night at almost midnight. When the van pulled in and the drivers got out, they said that out of all of the pups in their transport, Wally was the only one who never made a sound. When they opened the doors and let him bound out, he glanced around the circle of people and then he made a loping, long-legged bee- line for me. I have had to concede, since then, that my husband was right. A Shepherd was an amazing choice. I’ve learned that the half Husky part is it’s own animal, that his blue eye is very symbolic of the days when his personality is way more Husky than Shepherd. But, since he’s bonded with us it really doesn’t matter which personality we’re getting from him, the cool, playful blue or the snuggly, warm brown, he’s the best boy you could ask for. And all of that goes back to the one-woman show (plus some Shepherd loving volunteers) that is German Shepherd Rescue Indy. I began following GSD Rescue Indy’s Facebook page where Amber faithfully updates the stories of each rescue. You can tell how incredibly invested she is, in each and every dog she has the chance to save. Not just in saving their lives, but in finding them the best home possible. I know that circumstances like ours are unusual - Amber doesn’t generally pull from out of state shelters, nonetheless she stays busy all the time. For all of the dogs that come through her shelter, Amber makes sure they are spayed/neutered, vaccinated and checked for the usual ailments. She also does a behavioral assessments and tries to help each prospective family have a good understanding of their new friend, before they come into a new home. If you’re an Indy resident who has been thinking of adding a four-legged friend to your family and if your preference is a larger breed, I hope you consider these Shepherds. If you’d like to learn more about the rescue or look at the dogs currently available for adoption, check out the website. If Shepherds aren’t for you there are certainly other shelters and rescues in Indy. Check these out! Me and me.